Startling, recent transmissions and recitations from a weird and alien country called Albany brought word that the Governor of New York State has arranged to accelerate the Kosciuszko Bridge project. Complicated planning, difficult execution, and extreme expense hang gruesomely around this project- originally scheduled to commence in 2014, and now expected to begin in 2013. Construction on a new bridge is now expected to begin in spring 2013 — a year ahead of schedule, thanks to $460 million made available for the job by Gov. Cuomo’s New York Work initiative. 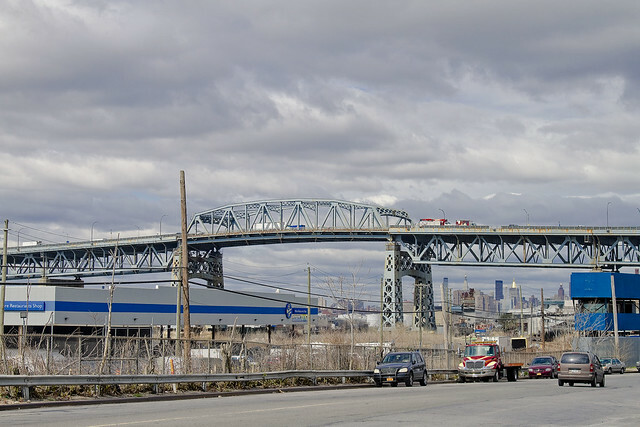 The 73-year-old bridge, which carries the Brooklyn-Queens Expressway over the Newtown Creek, qualified for the money in part because it is on the state’s “deficient bridge” list. It’s the single biggest project made possible through the New York Works program, an initiative to create jobs while repairing the state’s infrastructure. 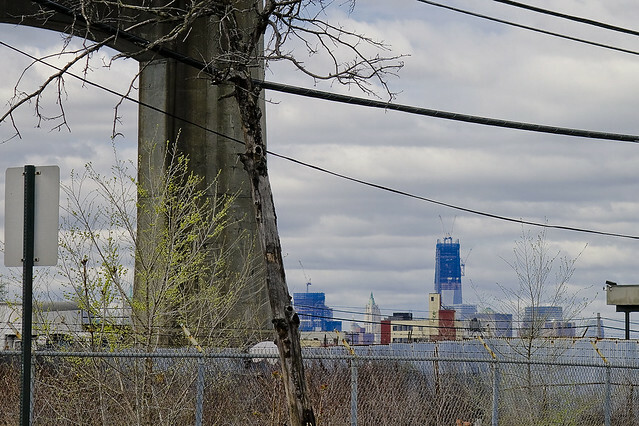 The 1939 workhorse, erected at the whim of Robert Moses, will no longer soar above that mirrored ribbon of risible metaphor known as the Newtown Creek in just a few years, as scheduled work is meant to conclude in 2017. Area wags shrug and sigh at this, wearily offering that such projects often extend well past their scheduled and budgetary goals, and that the Creek itself will present a series of unexpected problems to be solved. Following seven years of alternatives analysis, environmental studies and extensive partnering with community groups and stakeholders, the Federal Highway Administration (FHWA) approved the New York State Department of Transportation’s (NYSDOT) selection of Alternative BR-5 for a new Kosciuszko Bridge in its March 9, 2009 Record of Decision and granted authorization to proceed with Final Design. The Project Team has been working to complete key initial phases of the Final Design which would lay the groundwork to develop and complete the detailed design of the new bridge structure. Extensive documentation exists at the State DOT website, with coruscating revelations about both the current structure and anticipations of obstacles and opportunities which will be encountered during pursuit of the new structure. Your humble narrator, threatened by such rapid change, remains nevertheless excited about the idea of a pedestrian walkway overlooking not just the Creek itself- but Calvary Cemetery. Architectural drawings of the future DUKBO (Down Under the Kosciuszko Bridge Onramp) show an intriguing and modernist setting. Under all Build Alternatives, excavation of soil would be performed to a depth of about 4.5 m (15 ft), and the walls of the excavation would be braced. Contaminated soil and groundwater would be collected and disposed of. The new foundations would be pile supported, and either large diameter drilled piles or concrete filled driven pipe piles would be used. Drilled pile construction would generate less noise and vibration than driven piles, but may be difficult to install if boulders are encountered. Additionally, there is widespread soil contamination in the area, and contaminated soil and water extracted while drilling would need to be collected, treated and disposed of properly. This construction impact study assumed the use of driven piles. After pile installation is complete, formwork for the pile cap would be installed, rebar installed, and concrete placed. Pier construction would follow, working from ground level up in approximately 2.5 m (8 ft) segments. Formwork would be installed, rebar installed and concrete placed. After the concrete has cured sufficiently, the forms would be stripped and the sequence would be repeated until the pier was complete. A frequent commenter at Newtown Pentacle, “George the atheist”, asked me a while back for clarification and or documentation of my assertion that the reason for the truss bridge’s enormous height over the Creek was to allow egress to ocean going vessels with high stacks (smokestacks). During the course of some general research on Newtown Creek in the first half of the 20th century, this 1951 photo popped up at the NYS Digital collections site which illustrates just such a scene. 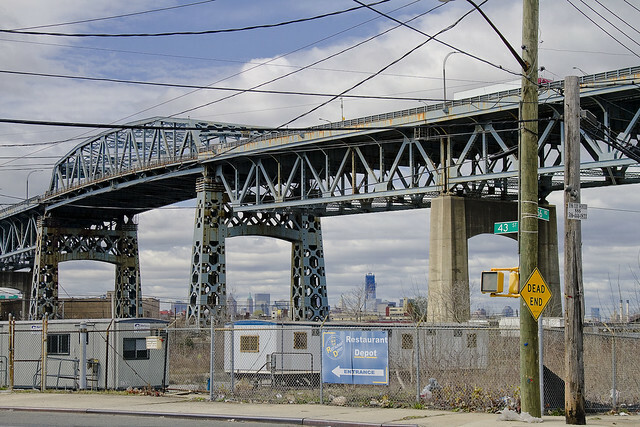 The Kosciuszko Bridge is a truss bridge that spans Newtown Creek between the New York City boroughs of Brooklyn and Queens, connecting Greenpoint, Brooklyn and Maspeth, Queens. 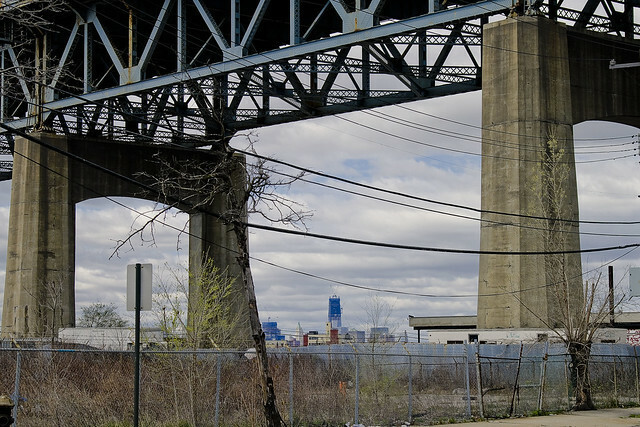 It is a part of Interstate 278, which is also locally known as the Brooklyn-Queens Expressway. The bridge opened in 1939, replacing the Penny Bridge from Meeker Avenue in Brooklyn to Review Avenue and Laurel Hill Boulevard, and is the only bridge over Newtown Creek that is not a drawbridge. It was named in honor of Tadeusz Kościuszko, a Polish volunteer who was a General in the American Revolutionary War. Two of the bridge towers are surmounted with eagles, one is the Polish eagle, and the other the American eagle.